You can have the freedom to enjoy shopping malls, parks and more with folding mobility scooters. 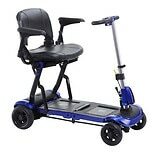 These medical scooters can be simple and easy to fold for convenient transport. Choose between colors, weights and features to find the folding mobility scooter for you. Brands Drive Medical, Shoprider and more offer 3-wheel and 4-wheel mobility scooters. 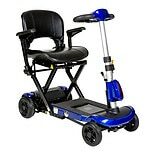 Medical scooters have many features to choose from that can make getting around comfortable and practical. Functional features include weight of the scooter in case it will have to be lifted in and out of vehicles often. Also consider battery life, range per battery charge, and the durability of the tires. 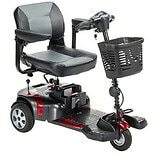 For comfort, look for padded seat cushions, adjustable arm rests and cushioned foot rests. 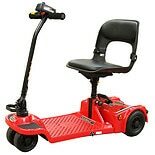 When you're not using a folding mobility scooter, you can rely on other mobility aids to help you get around. 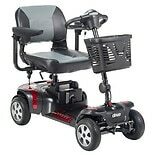 Browse our selection of walkers and walker accessories, as well as canes in various sizes, designs and materials. For your bathroom safety, there are transport chairs, bathroom grab bars as well as shower benches. You'll also find other aids to daily living, such as braces and supports for arthritis and other conditions.